On this date in 1573, 19-year-old Frantz Schmidt — heretofore only an apprentice to his father’s craft — conducted his first solo hanging. As the body of the thief hung there, his father or perhaps another established Scharfrichter stepped forward and ritually slapped the teenage hangman three times, announcing his successful passage into the ranks of Germany’s master executioners. 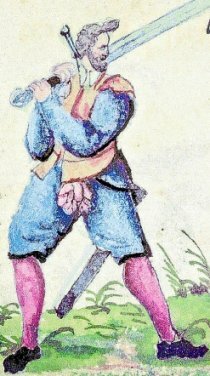 “Leinhardt Russ of Zeyern, a thief. Executed with the rope at the city of Steinach. Was my first execution.” Those words begin Meister Frantz’s remarkable diary* of 361 hangings, beheadings, breakings-on-the-wheel, drownings, and burnings — as well as many other sub-capital punishments, primarily as the executioner of Nuremberg from 1578 to 1617. Nuremberg executioner Frantz Schmidt at work in 1584. Executioners occupied a strange outcast social niche, with charge not only of death sentences but of other dishonorable public tasks. Either as cause or consequence of this, the profession carried its own stigma for underworld less-than-respectable behavior; it was not unheard-of for a shady executioner to wind up climbing the scaffold as patient rather than hangman. But in his 45-year career, the sober Meister Frantz operated with ahead-of-his-time dignity and sobriety, so much so that Schmidt was granted citizenship in Nuremberg and eventually had his civic honor officially restored. He freed himself and his heirs from the social pollution inherent to his life’s work. ET: Your book is built around a sort of life’s mission by Frantz Schmidt to return himself and his family to respectable-ness. Certainly he accomplished this marvelously in the end, but I’m curious how firm do you feel is the inference that this was his specific intent from the start? JH: I have no doubts that as a child, Frantz Schmidt was repeatedly told the tale of his family’s fall from grace, especially since he can still remember so many details even as an old man. We also know from his own words in his appeal to the emperor to restore that lost honor that his grandfather, father, and his own children all felt the sting of this stigma. Finally, the late-in-life struggles to assert that regain honor — against the challenges of his bitter successor — further underscore the centrality of this mission in Frantz Schmidt’s life. Executioners often had a family trade at this point, but the Schmidts — specifically the father, Heinrich Schmidt — had a bizarre path into this business via the German nobility’s old prerogatives. Could you explicate the “ancient custom” that allowed Albrecht Alcibiades to force Frantz’s father Heinrich, who was not an executioner, to become one? And for that matter, the social customs that then led Heinrich’s neighbors in Hof to treat him as a dishonored untouchable after he was forced to carry out these three executions — rather than viewing him, as we might today, as himself a victim who ought to be helped to get back to his real life? Most European laws in the early sixteenth century were customary and highly localized. Legal codification throughout jurisdictions was just getting underway. This meant that two villages only a few miles apart might have very different traditions regarding something like execution. In the larger cities, such as Nuremberg, and well organized territorial states, such as the prince-bishopric of Bamberg, standing executioners on salary were the norm. But in many of the hundreds of tiny German states during this period, execution by the victim’s oldest male relative or by another local male was still practiced. In the case of Hof, the margrave intentionally invoked an ancient and outdated tradition because he was in a hurry to get the job done. The stigma around the job of executioner in general was, by contrast, nearly universal. There seems to have been a little less hostility in southern German states but nobody would have openly socialized with an executioner or his family. As I describe in the book, the severity of this stigma — like all social prejudices — would depend on the individual or occasion in question. So, while some people clearly had sympathy for Meister Frantz, there were still stark boundaries of propriety as to how they might express that sympathy. Executioners had charge of a variety of disreputable tasks and spheres of civil live: refuse, prostitutes, lepers, torture, and so forth. I’m struck by the importance of Schmidt’s Nuremberg assistant, “the Lion”, in allowing the faithful executioner to (somewhat) separate some of the most visibly dishonorable tasks from Schmdit’s direct purview. Just as a realistic matter, could Frantz Schmidt have reached respectability had he himself had to handle everything personally? You’re right, the Lion played a key role in this respect. The broader evolution of the job was also significant, from a kind of catch-all for various unpleasant tasks to a civic professional focused on interrogation and punishment. You can also see this in the clothing that executioners start to wear in the sixteenth and seventeenth centuries, usually either colorful bourgeois outfits or military garb. Frantz Schmidt’s later entries have a great deal of detail, and you use that to tease out the executioner’s psychology, and the way he thinks about crime, sin, choice, and misfortune in his mature adulthood. It’s quite intriguing. Why, however, did Schmidt begin his journal in the first place? Is there something his shorter, earlier entries tell us about the younger man and the evolution of his views of the “poor sinners” he handled? After a long time — and especially after I found the oldest version of the journal — I figured out that he started the journal upon his 1578 appointment in Nuremberg. This means that he reconstructed the executions of the previous five years from memory (and without dates). Why then? The timing strongly suggested to me that he was already thinking about using the journal as a supporting document in his eventual appeal to have his honor restored. As for changes over time, the most obvious ones are that his passages become much longer, more detailed, and more concerned with motivations and explanations than the earlier, bare-bones accounts. The main evolution in his thinking about poor sinners shows both harsher judgments of those who squandered countless chances to reform and greater pity for those who simply make a bad decision in the heat of the moment. You have a fascinating chapter devoted to Schmidt’s sidelight as a healer, and to the important ways this practice intersected with executioners’ expertise in [harming] the body. I was amazed that Frantz Schmidt himself also took part in the era’s dissection trend. If one were a regular Nuremberger at this time, would one have any compunctions about a medical consultation with the executioner, a man one might otherwise shun? If a non-executioner physician were available too, would there be any intrinsic preference for the physician as a more respectable figure? Yes, it’s quite a paradox. You would think that most people would be squeamish or embarrassed about consulting an executioner on medical matters, but by his own estimate Frantz Schmidt saw 15,000 patients over the course of 45 years — fifty times the number of individuals he executed. So he must have been doing something right. This journal was (re-)discovered at an interesting point, at the beginning of the 19th century when public executions are ending but romantic German nationalism is beginning. How has “Frantz Schmidt” the present-day cultural figure been used and misused by we moderns? What’s the most important misapprehension that reading his diary ought to dispel for us? This is really the focus of my epilogue, which discusses how “medieval” executioners have been used for the purposes of “enlightened” penal reform, nineteenth-century gothic fantasies, and in modern tourism to elicit disgust, amusement, or even the glorification of pain and suffering. My chief goal in writing the book was to get closer to understanding one such man in his own terms and in the context of his own society. To the degree that the book succeeds, parts of his world will look bizarre and alien, while other aspects (especially how people treat each other) will be strikingly familiar. * Print-on-demand editions of Schmidt’s original diary are on the market. Although these derive from what I believe to be public domain translations, I have not been able to locate a free English copy online; German speakers can read it here. ** Also recommended: this podcast interview with Dr. Harrington.